Scientific researchers studying climate change have come to the conclusion that the effects are so great that the earth has entered a new geological epoch, which they have named the Anthropocene. 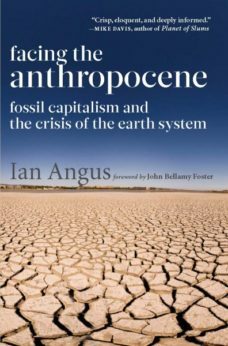 Ian Angus, in this book, sets out to explain the reason why. The existence of global warming and the threat of catastrophic climate change is now generally accepted as fact. Governments, as represented at international conferences, have reluctantly recognized the need for action – not that they ever fulfilled their commitments. The Paris conference in 2014 was hailed as a breakthrough, as it appeared at last that they were getting serious. Even so, the commitments made there are certainly too little and possibly too late. There continues a well-financed campaign of climate change denial, which featured largely in Trump’s election campaign and threatens to derail even the inadequate response that has been promised. This group came to coordinate the work of thousands of scientists internationally. It has come to the conclusion that the effects of human activity are so great as to begin a new geological epoch, which they call the Anthropocene. After thirty years’ work, the program closed at the end of 2016. In the 1950s there was a great acceleration in the rate of production of carbon dioxide and the consequent rise in temperature. First in North America, then in western Europe, there was a massive increase in car ownership and the accompanying build-up of suburbia. Air travel became commonplace, and trade expanded. Agriculture became more mechanized, using more fertilizers and pesticides, to the extent that the energy input is ten times greater than the food energy produced. All these required vast quantities of oil, while the military industry, the greediest and dirtiest of all, grew out of all proportion. 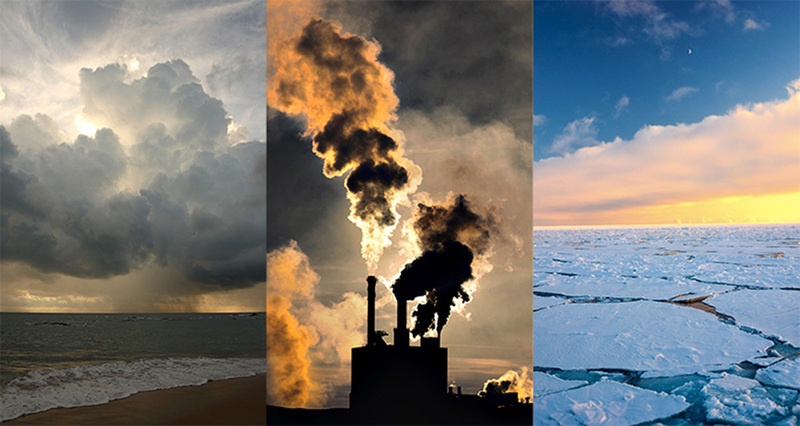 The carbon dioxide produced is a “greenhouse gas,” which has the effect of holding the heat in the earth. Were it not in the atmosphere, the earth’s temperature would be 35° lower; with too much it would be unbearably hot. The greatest concentration of carbon dioxide reached in the Holocene was 300 parts per million; in 2015 it reached 400 ppm, the highest level for hundreds of thousands of years. Consequently, the average earth temperature is also outside the range of the Holocene; in fact, it is at the highest level in human experience. A rise of 1°C does not sound much, but it entails much greater extremes in the weather, more heat waves, hurricanes, droughts, and floods, which we are already experiencing. The melting of glaciers threatens some of the major river systems of the world. The Paris agreement set a target of an increase of less than 2°C above the pre-industrial level. According to Angus, in the unlikely event of all the commitments made there being fulfilled, there is a 90 per cent chance of the temperature rising past 2° by 2100. If business as usual continues, it could rise by 4° by 2080. A rise of 2.7° or more would have disastrous effects on the poorer, tropical countries of the world. The people who contributed nothing to the problem are the ones suffering the greatest hardship: the world’s wealthier countries produced 80 per cent of the carbon dioxide and the poorest countries less than 1 per cent. Some see this as a security problem: how to keep immigrants out, whether they are fleeing the consequences of global warming or the wars created by the imperialist powers, which are also about oil. The climate crisis becomes an argument for militarism. Is there a fix? Looking at it as a purely technical problem, Angus answers, “Perhaps,” and examines a proposed project (Deluchi and Jacobson, 2009) to replace oil, using millions of wind turbines and solar panels. Angus thinks this is politically impossible: “Fossil fuels,” he writes, “are not an overlay that can be peeled away from capitalism, leaving the system intact.” The British Empire was fuelled by coal; oil made America great; what fed them has now become toxic. And the capitalist imperative is accumulation. If capitalism is not growing, it is in crisis. “Green” policies proposing limitations to growth (for example Richard Douthwaite in The Growth Illusion) are incompatible with capitalism. Capitalist states and the capitalist system are neither willing nor able to face up to finding a solution to the crisis of the earth system. Socialists have given insufficient attention to the climate crisis. This book provides a much-needed education and a call to action. Read it. This review first appeared in Socialist Voice. 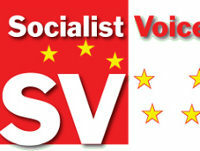 Edwards writes for Socialist Voice, a monthly publication from Dublin, Ireland, published by the Communist party of Ireland.